I took advantage of solar and wind power this week. It was cheap, sustainable, and easy to do. Okay, I know what some of you are saying: that’s disingenuous at best. This is how clothes were dried for centuries: putting clothes out in the sun. The sun, and the wind, speeds the process of evaporation. 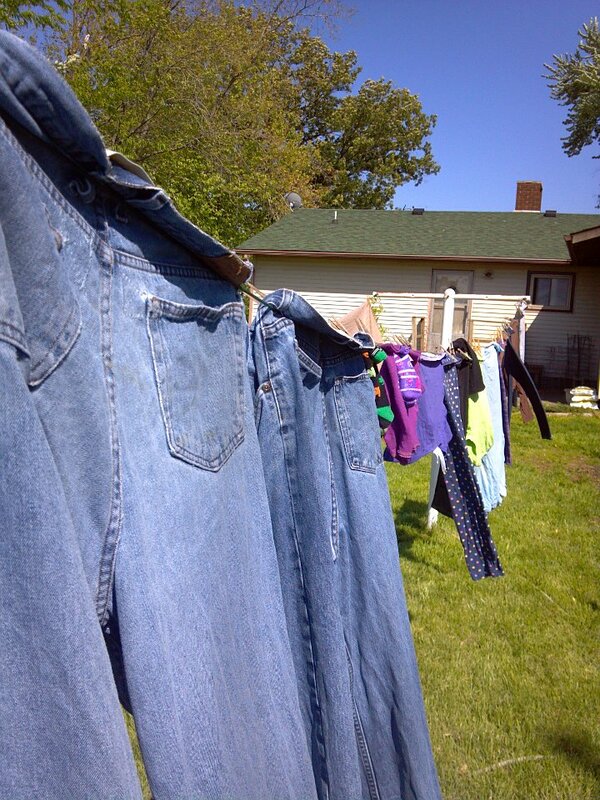 The sunlight helps sterilize the clothing, an essential component to deodorizing clothing; sunlight is used in some parts of the world to sterilize water. Six hours of direct sunlight can sterilize a bottle of water. I didn’t have to put expensive solar cells on my roof. I didn’t have to put a gigantic windmill on my property. Some people think that changing the way we do things, and using alternative energy, means we have to replace our fossil fuel usage with alternative energy sources, and change nothing else. Nothing could be further from the truth; it is, in my opinion, insane to me to think that we’re going to use solar cells, windmills, hydroelectric dams, etc. to power electrical clothes dryers. We could go on. Do you need light in your home during the day? How about windows? Windows are awesome. They let sunlight in. You don’t have to pay a monthly bill for sunlight. Do you live in an arid location and want to cool your home? Do you scoff at geothermal heating and cooling? You shouldn’t; wealthy Romans cooled their homes with geothermal cooling. It sounds crazy, but it’s true! How did they work? They would have a tile pipe buried at the frost line with endpoints outdoors, and in the home. Somewhere in the home would be a chimney with good exposure to the sun, painted black. The heating of the chimney would start the convection process, and the power of the air venting out of the chimney would pump air through the tile pipe. It’s a process that’s used in the American Southwest. Solar water heaters? It’s an old concept, and they were once common even here in the United States. I could go on about how “alternative” energy isn’t all that new, but others have said it before me. It’s also insane to think that standing in the way of these changes is somehow going to keep prices down. Power companies have already warned us that electricity prices are going to go up, whether we change or not; we can either pay more to cut down on our energy usage, or we can pay substantially higher prices to subsidize new power plants and infrastructure. If you’d rather keep living as you are until you’re forced to changed, more power to you (heh); I’ll choose responsible behavior, and cut back, thanks.